FBNC is a media content company operating the FBNC television channel, Vietnam’s first and only channel specializing in finance and business news. 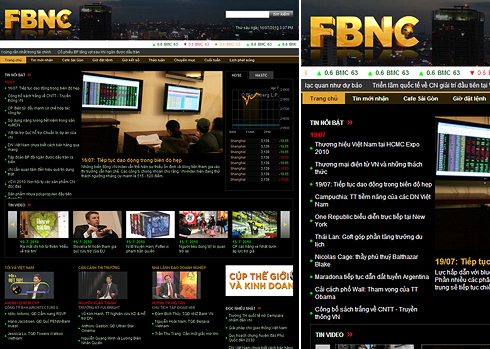 FBNC broadcasts information directly from the trading centers of HCMC and Hanoi, and offers live reporting of information worldwide. FBNC provides in-depth analysis and forecasts by leading experts on issues such as finance policies, goods and services, technology, real estate and import-export. The channel is the first financial channel in Asia to broadcast in Full-HD. It uses the same modern management systems as the world’s leading channels such as Bloomberg, CNBC and CNN. FNBC is broadcast over the HTVC cable network, with plans to expand to nationwide cable, mobile and Internet TV. It also operates a companion website, FBNC.com.vn.